May is my favourite month. Not only, because my birthday is in May, and not only because it is finally possible to enjoy warm spring days, but it is due to the calendar. There are so many days off! Working weeks are short, days are long. 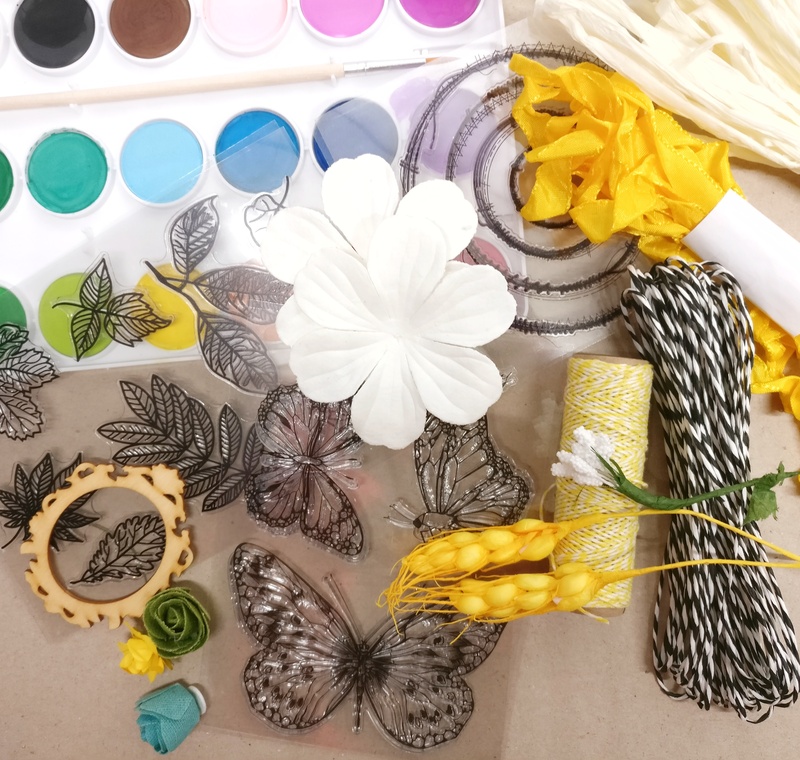 A admire Sizzix blogspot with the designer Olga Vasilieva. 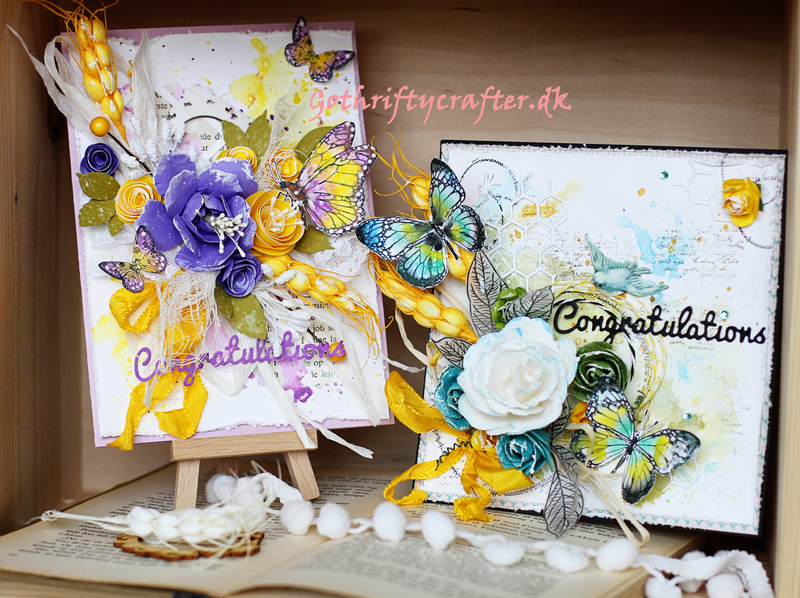 Her creations were a great inspiration for these two cards. I wanted to achieve the same effect with "careless", yet coherent background of water colour splashes and stamps. Watercolour paper was used for the backgrounds. Here you can see the initial stages, before all the madness :-) I tried different techniques and must say, had to toss a couple of pages. 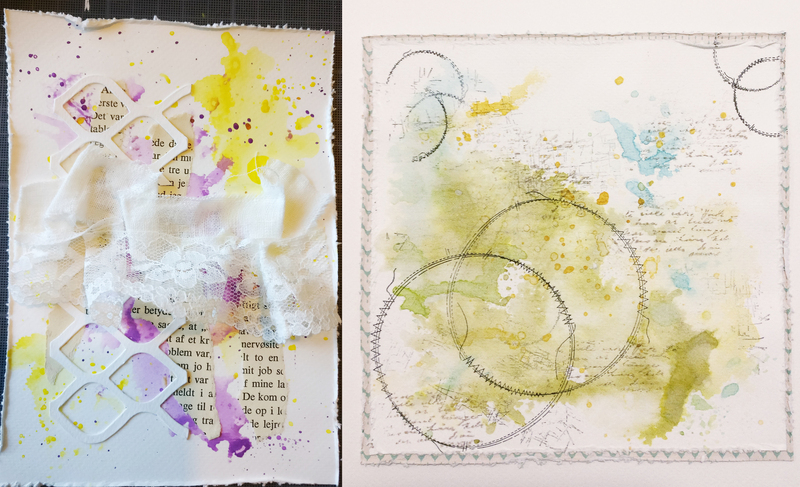 I started with wetting the paper with a brush and applying water colours into it. It just did not work and did not give the feeling of "randomness". Then I decided to apply the paint onto a plastic bag and rub it afterwards onto the paper. That looked much better. 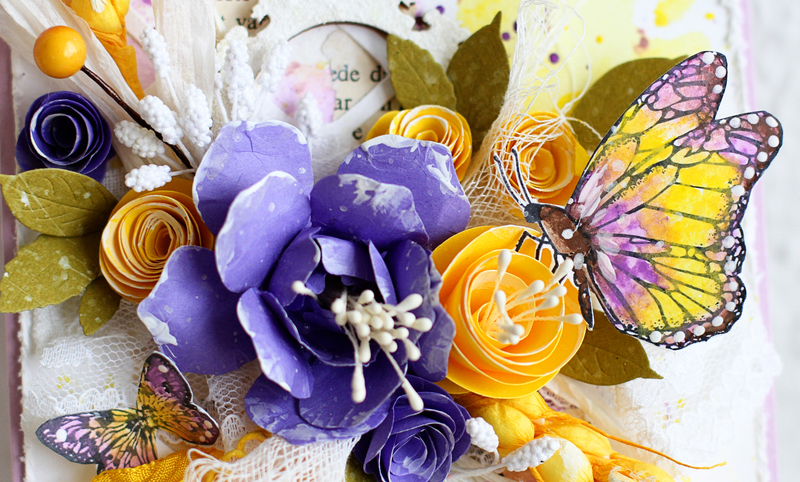 To the left - I added torn book pages, as well as a framework Sizzix die cut and lace. To the right - different stamps. Still insisting: "nothing is too much in scrapbooking". 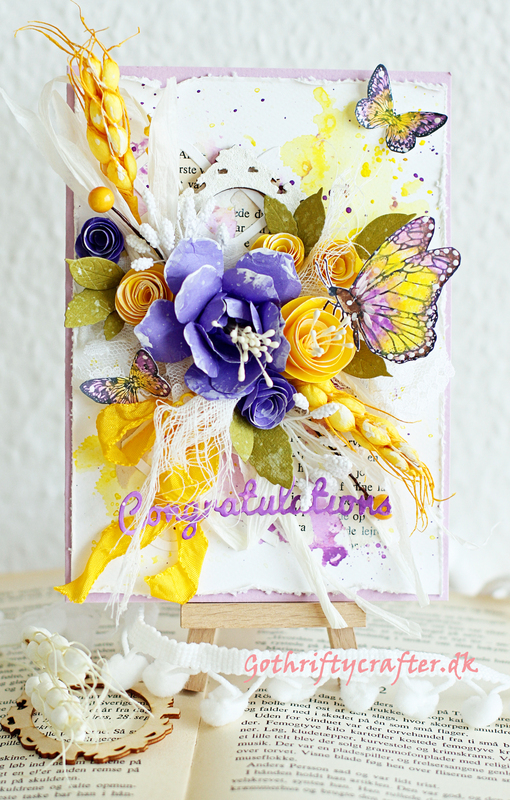 Purple rose in the center is a die cut, other roses are hand cut from a circle and rolled up. White frame has been embossed, and butterflies are stamped, water coloured and cut. I also added some embellishments as berries, ribbon, cheese cloth, stamen, wheat and rose leaves. 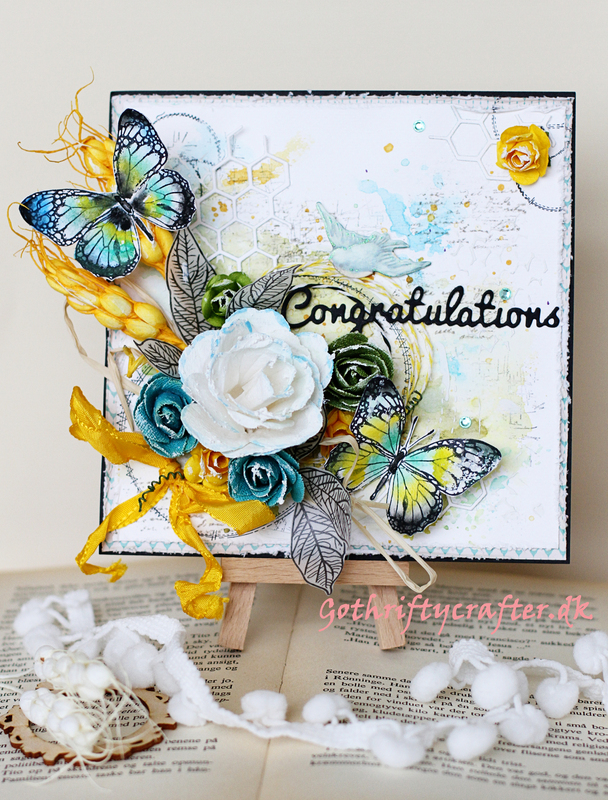 For this card, I used honeycomb die cut and twine cord for the background. White rose is Prima petals, other roses from Søstrene Grene and Ebay. Leaves are embossed on a vellum. Butterflies are stamped and hand-painted as well.